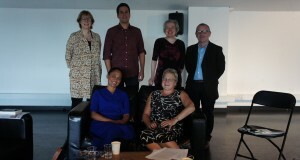 Rushanara Ali, MP for Bethnal Green and Bow, visited Rich Mix earlier this month to meet with a small number of arts charities in advance of the government’s forthcoming Comprehensive Spending Review. As well as meeting with Sound Connections she also met with Headliners UK, a charity which develops young people through journalism, Tamasha theatre company and engage, the museum and gallery education organisation. If you would like to find out more about how we can make the best possible case for arts and culture in the forthcoming Spending Round please do check out the recently launched Arts for Britain campaign.